Kirk Hammett is excited to continue the partnership for Comic-Con International in San Diego, California with Nuclear Blast at the Nuclear Blast/Stern Pinball/KVH Toys/JSR Merchandising Booth (#501)! Fans in attendance who buy these limited edition figures at the booth are guaranteed a ticket to visit the Nuclear Blast/Stern Pinball/KVH Toys/JSR Merchandising booth (#501) on Saturday, July 11th for either a 1:30 PM or 3:30 PM and get their figures signed by Mr. Kirk Von Hammett himself! 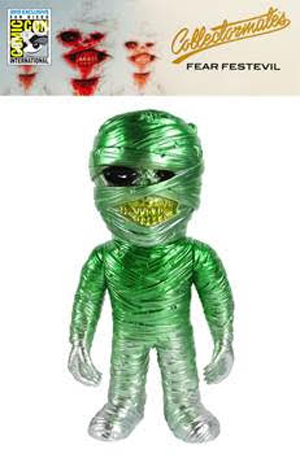 The Limited Edition 9” Vinyl Figures production numbers are 100 Tomb Mummy Green and 50 Tomb Mummy Metallic Green, 100 Bad Brains Green and 50 Bad Brains Metallic Green. These are expected to sell out FAST!!! Since he was a young boy in San Francisco's Mission District, Kirk Hammett has been fascinated by all things "monster" and "sci-fi." From early years spent watching Creature Features to his present status as one of the foremost collectors of horror memorabilia in the world, the METALLICA lead guitarist's passion for the macabre and mysterious has only grown deeper. In 2011, Kirk formed KVH Toys to enable him to create custom horror collectibles for like-minded fans, and in 2012 he published his critically-acclaimed first book, Too Much Horror Business (now in its third print run via Abrams Press) which documented the highlights of his famous collection. Hammett has also hosted special event screenings of his favorite classic horror movies at venues such as the Chinese Theatre in Hollywood and the Balboa Theatre in San Francisco. In February 2014, Hammett launched his inaugural horror convention, Kirk Von Hammett's Fear FestEvil, at the historic Regency Ballroom in San Francisco. Featuring a wide array of guests from the worlds of horror & music (The Walking Dead's Greg Nicotero to British legends of extreme metal CARCASS and fellow Bay Area thrashers DEATH ANGEL) as well as some of the most creative vending yet seen (including a taxidermy class), Fear FestEvil was lauded by horror fans and critics alike as a unique entry into the world of horror conventions. Further products, events and publications are forthcoming, details of which can be found at KVHToys.com.